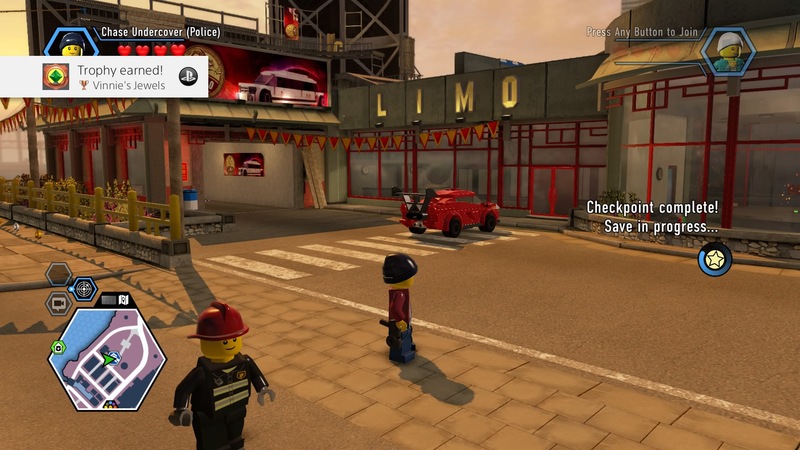 Chase gets in good with the mob (and robs a local bank) in Chapter 6 of our LEGO City: Undercover. It's all about La Cosa Nostra in Chapter 6: All in the Family. After helping out Chan, Chase needs to move on up and join Vinnie Pappalardo's crew to further the investigation into Rex Fury's whereabouts. 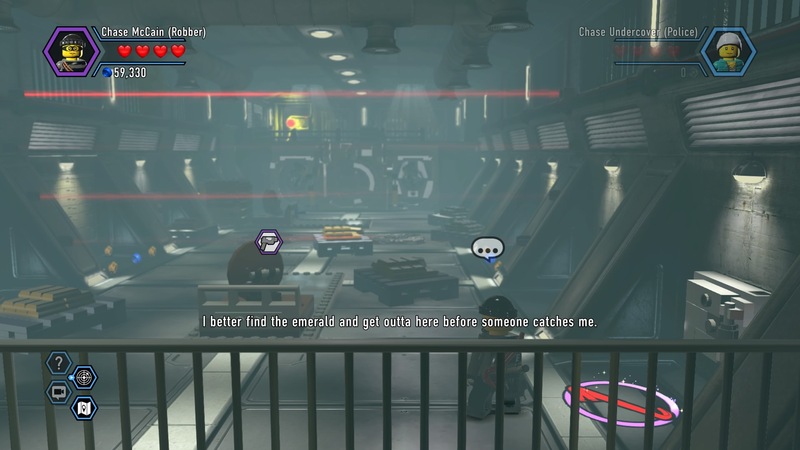 This chapter also includes the bank robbery level, sending Chase into the sewers to break into the vault and collect one giant gemstone for Vinnie. 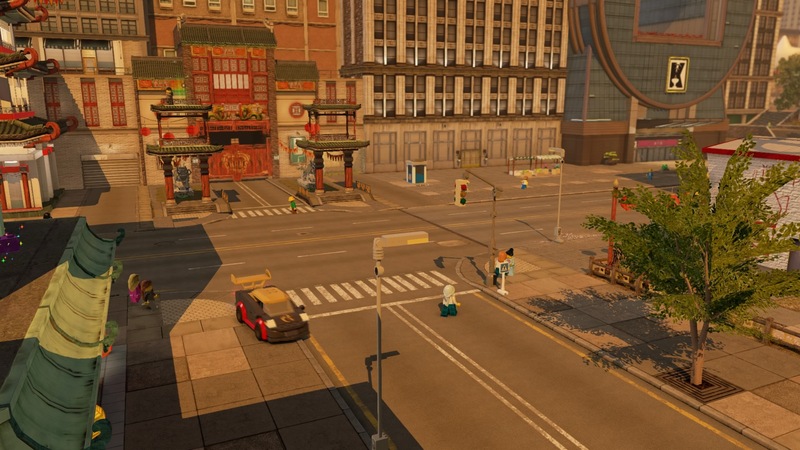 See what it takes to get made in LEGO City with step-by-step instructions for each challenge, and locations for all the Super Bricks you'll need in the bank. Chase needs to move up in the world - it's time to join Vinnie Pappalardo's gang. To do that, you'll need to rescue Vinnie's cousin Moe De Luca from his trial. All unpaid parking tickets. To bust Moe out of the clink, you'll need a prison truck. Go to the back of the Cherry Hill Police Station. There's a mechanic named Chuck near the garage. He's willing to trade a prison transport truck, but there's always a favor first. 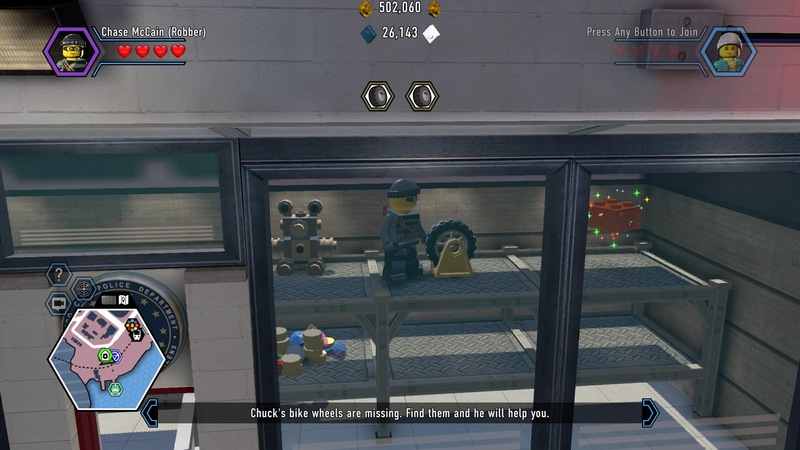 Grab the crate and place it on a green square in the garage, then build the hopping bricks to create Chuck's unfinished bike. You still need wheels. Wheel #1: Get this wheel at the back of the station. 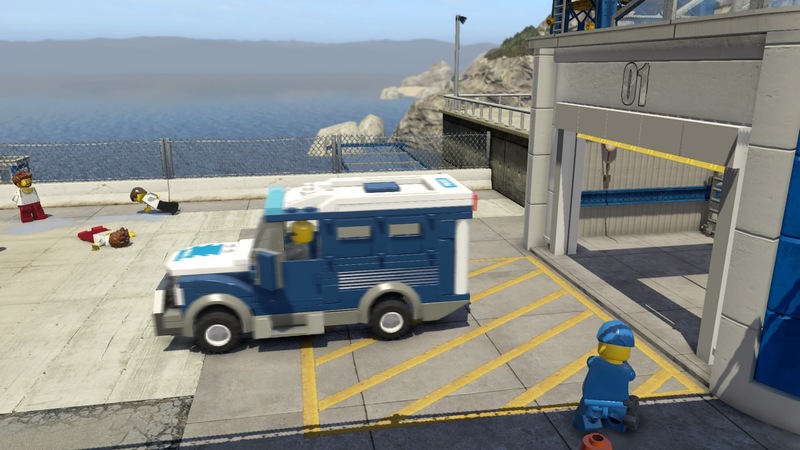 Use the Robber Disguise to bust open the crowbar door, then smash the LEGO object on the left to build a ladder. Climb up and attack the LEGO wheel near the Super Brick to get the first wheel. Wheel #2: Go down to the prison ferry jetty and build the hopping bricks to create a fishing rod. 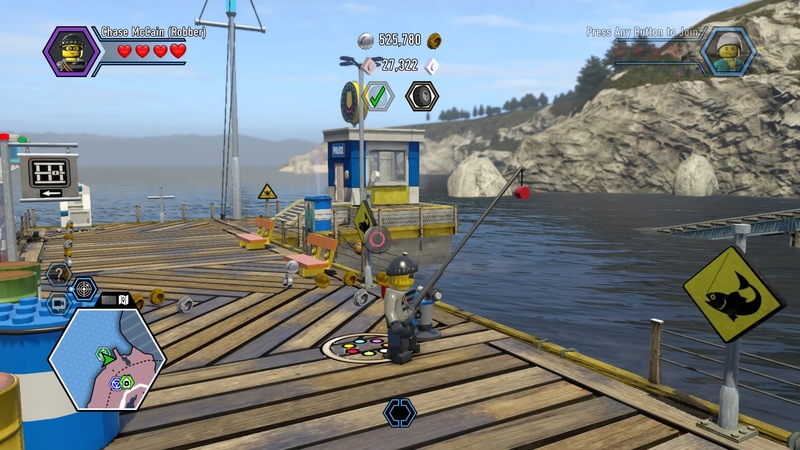 Use the fishing rod to collect the second wheel. 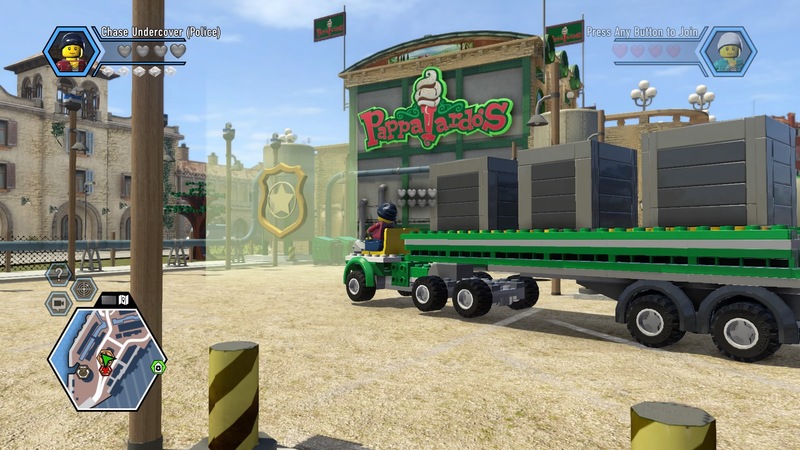 Take a spin around Cherry Hill and complete the time trial and Chuck will give Chase the truck he needs. Take your new truck down to the courthouse in King's Court to do the ol' switcheroo. 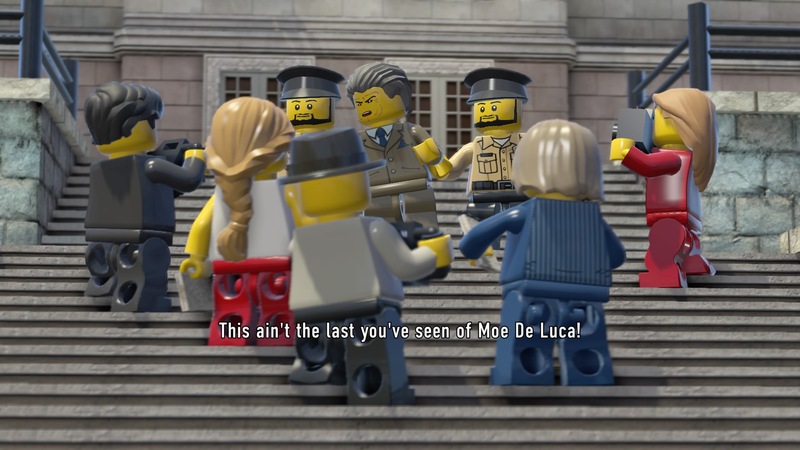 After picking up Moe, the cops will get on your trail. The hideout is in Uptown - evade the cops and get to the hideout to get one step closer to Vinnie. To impress Vinnie, meet up with Moe at the airport. Working with Moe, you'll steal fancy gizmos that are arriving in the city. At the parking lot, Moe will give Chase a new, fast suped-up car - use it to crash into the delivery truck! Hit the delivery truck four times, then hijack! Now it's a straight shot to Vinnie's restaurant. Introducing yourself to Vinnie, it's time to test this stolen technology - Vinnie wants Chase to rob a diamond with a Color Gun! Exiting the restaurant, Ellie will provide Chase with a secret entrance into the bank. 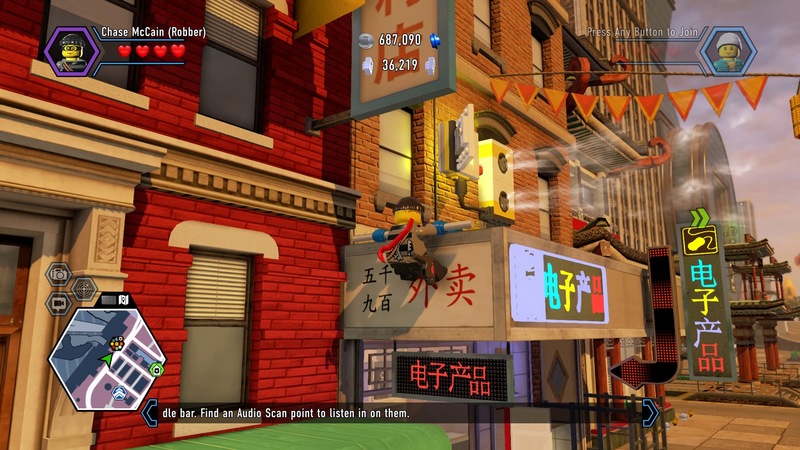 At the bank, crack open the nearby sewer cover with the Robber Disguise and dive in to start the level. 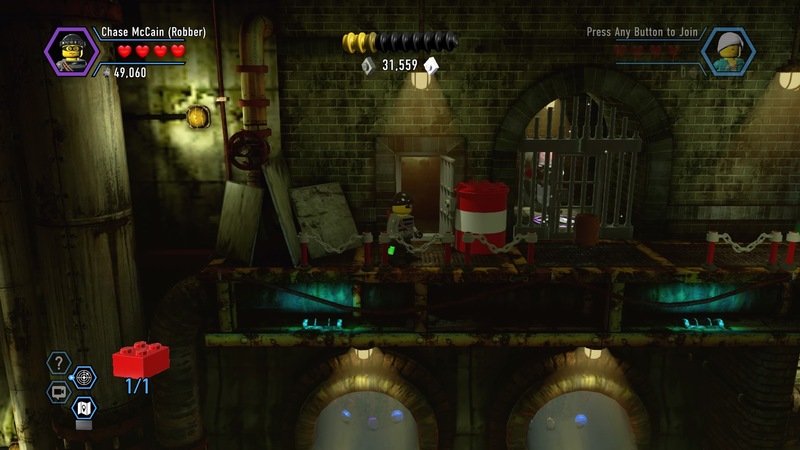 To get into the bank vault, Chase will need to navigate the sewers first. Start by opening the crowbar door to the left of the ladder with the Robber Disguise. Grab the wheel and place it at the bottom of the steps on the landing near the sewer water. Grab the key from the open pipe and use it to open the fence to the right of the ladder. At the path ahead, there are multiple open pipes spewing sewer water. 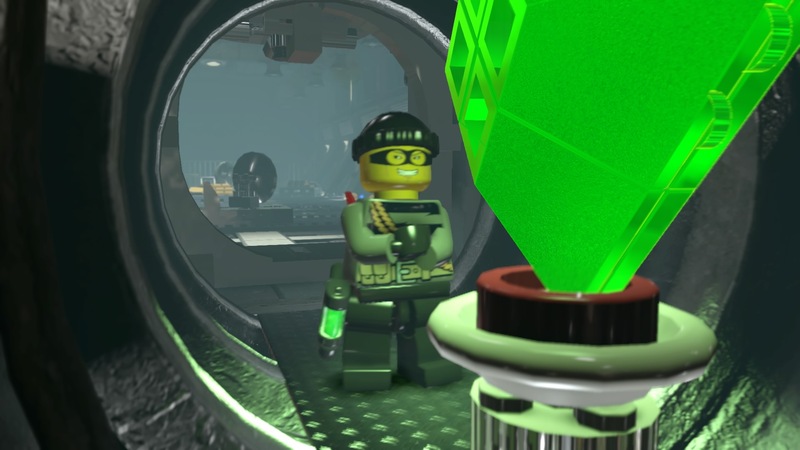 Use the blue / white LEGO ledge to shimmy past the sprays, closing each valve - first hit the switch, then use the Robber Disguise crowbar, and finally break the boulders with the Miner Disguise. When the path is clear, defeat the guards and hit the switch to reveal your first Color Switcher. 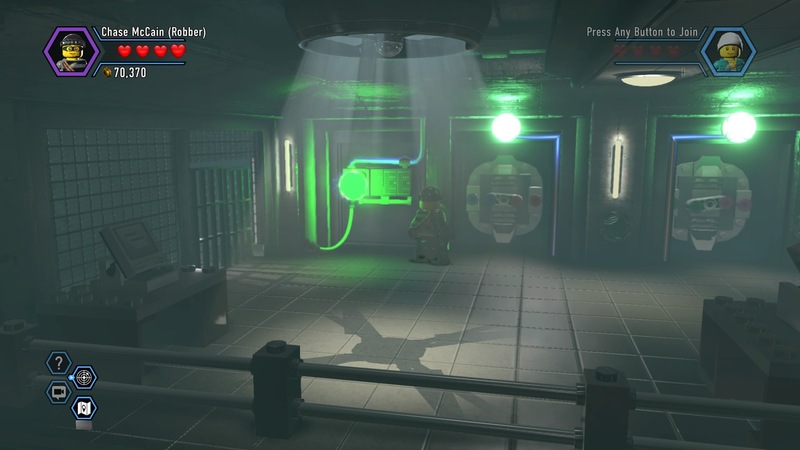 Swap to the Robber Disguise and use the Color Gun on the Color Switcher to collect your first color - green! Green activates red switch, and there's one nearby. Shoot the red switch with the green color gun on the left to open the gate. Grab the crate and deposit it on the green plot to the right of the Color Swapper. Build the hopping bricks to climb up! Crack open the door to get into the second sewer chamber. In the second chamber, drop down to the electrical panel. Next to it, there's a green barrel. 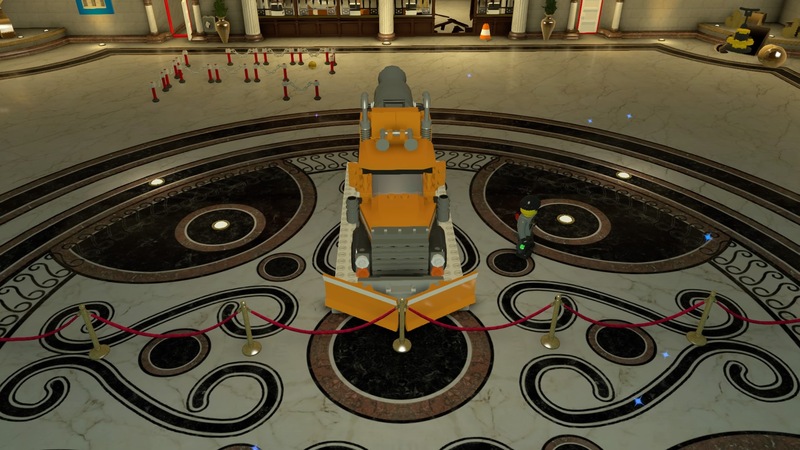 Smash the barrel and use the Detective Scanner to discover a dynamite bundle. Grab the TNT and place it in the barrel. 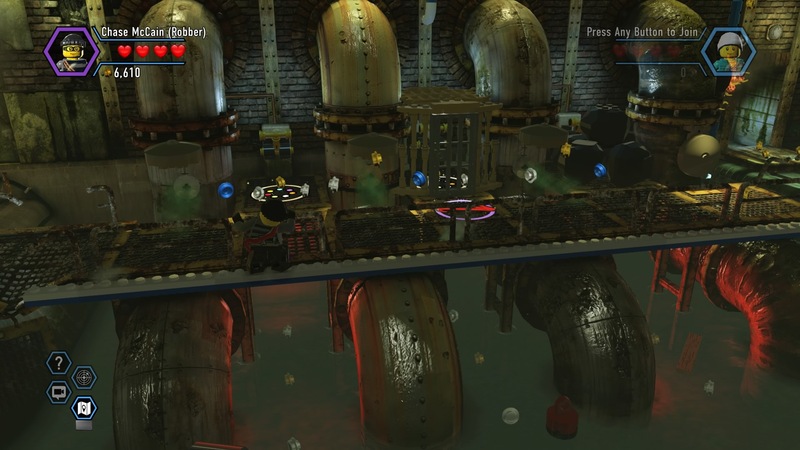 The destruction results in tons of hopping bricks - build them to create a floating vehicle! Use the flotation device to cross the green sludge on the right. Reach the platform and go up the steps, then slide under the blue / white bars to reach a locked door. Bust it open with the Robber Disguise and grab the wheel. 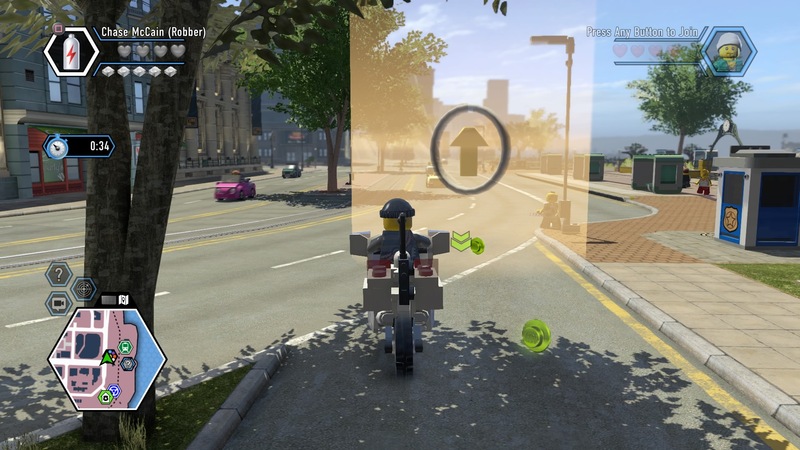 Place the wheel on the green waypoint and turn it to open a water valve. Ride up and go left - bust open the barrel near the blocked door to find TNT. Place it to blast the way to the Color Swapper. The machine gives your color gun the red color. 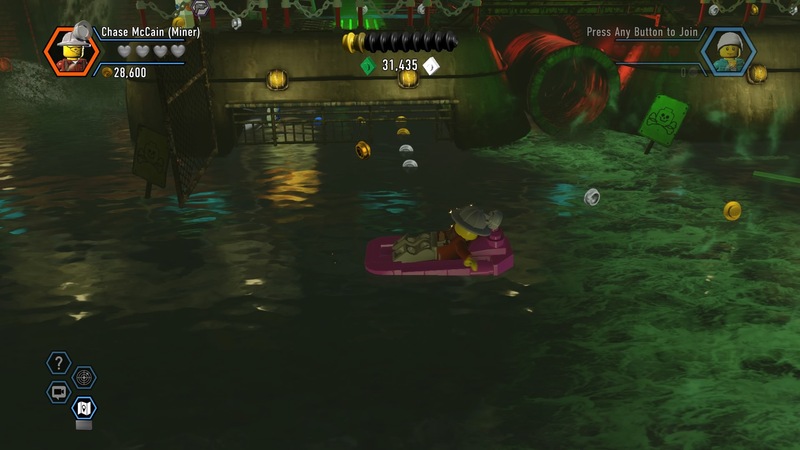 [Red Brick Location] The red brick is in the second room of the sewers. Ride the water geyser up and use the Robber Disguise to crowbar open the door near the dynamite barrel. Take the red color gun to the right and bust through the boulders. Shoot the green light to lower the platform that leads to more blue / white poles. Follow the pipes to the ladder to reach the third sewer room. 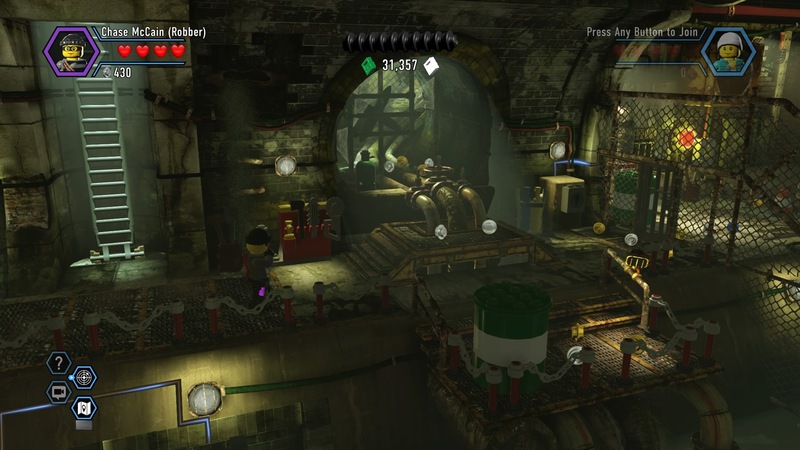 In this third room, smash the three brown crates and build the hopping bricks to create a platform. Push it to the left and pull down the grapple hook. Use the platform to enter the alcove and grab the TNT with a Miner Disguise. Place the TNT, then crack open the vent with the Robber Disguise. Welcome to the vault! Let's get cracking. Use the Robber Disguise to crowbar open the safe to the right. Use the hopping bricks to create a Color Swapper. Now Chase has the silver color - you can use it to turn bricks silver. 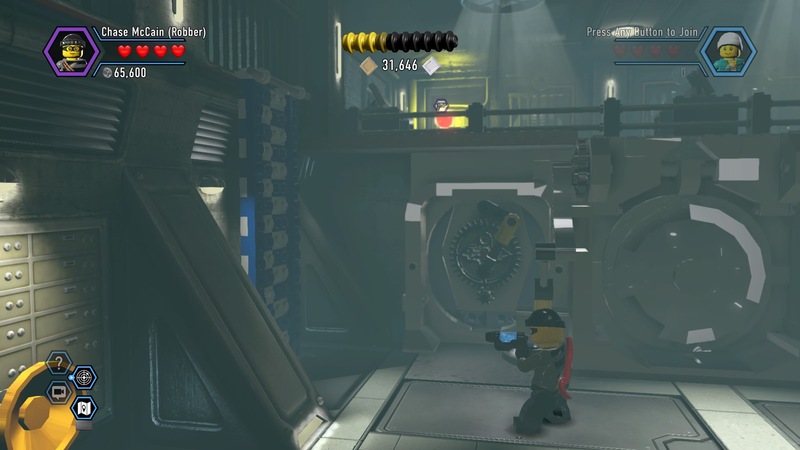 Shoot the LEGO object on the moveable surface with silver, then push it forward to redirect the first red laser. Move toward the background, and use the grapple hook to redirect the second laser. 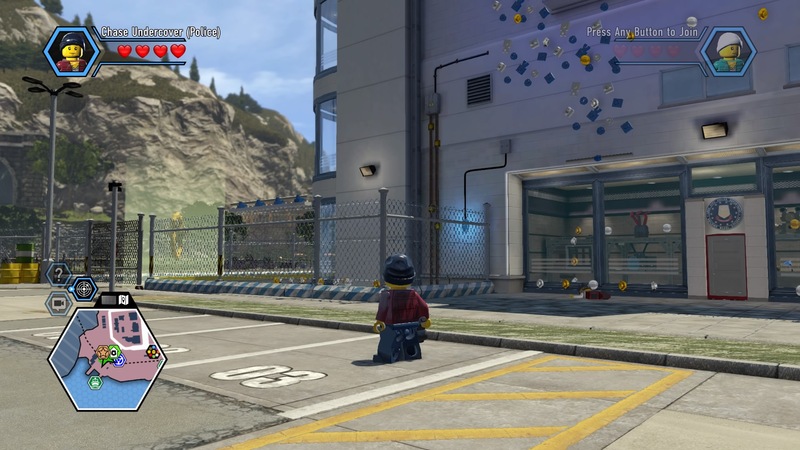 Now you can access a LEGO crate - place it on the green spot and build. You'll create a Color Swapper! Grab the blue color, then shoot the white LEGO wall to the left. Now that the wall is blue / white, Chase can climb it. On the upper level, use the computer and open the safe with the Robber Disguise. 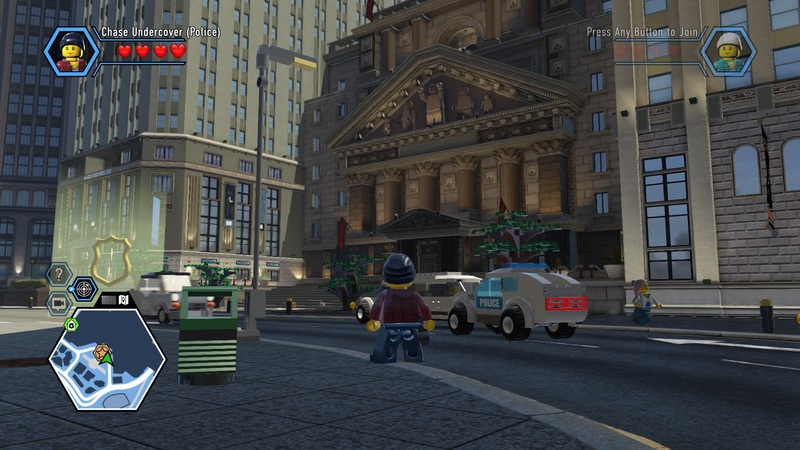 Build the new bricks, use the green Color Swapper, then shoot the red light to turn it green. Grab and place all three valves, then turn each. Stop turning when the light turns green - when all three lights are on, the vault door will finally open. 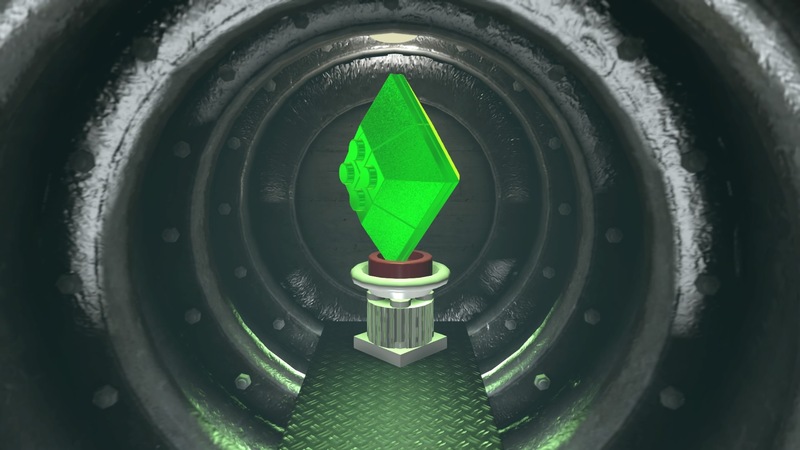 Approach the giant gem and... the alarm goes off! Climb back upstairs and deal with the guards, then exit through the left door. 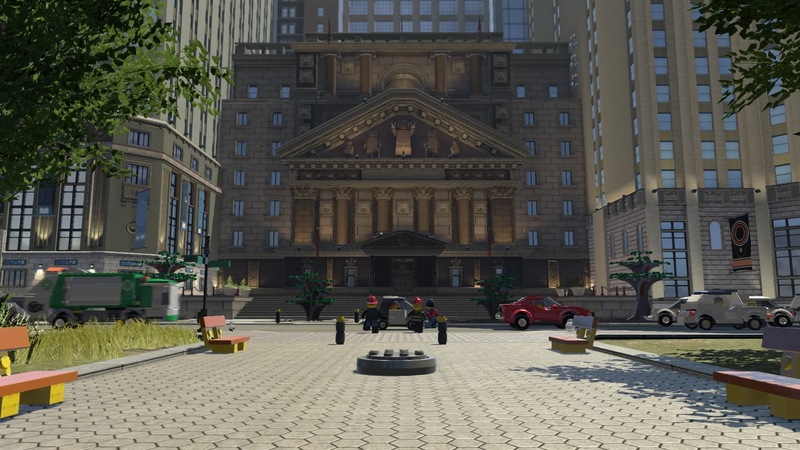 In the main lobby of the bank, you'll final another large Super Build. If you've been saving Super Bricks, you can escape the level right now with 30,000 points. Otherwise, you can search the area for more. Let's get looking. 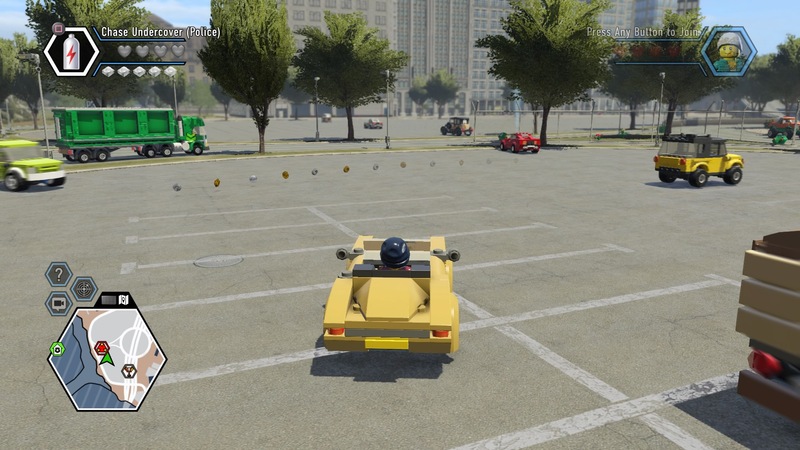 10k Super Brick: To the left of the Super Build, you'll find three number wheels. Turn the wheels so: Red is 10 (X), Blue is 3 (III), and Green is 7 (VII). Grab the key and enter the reception area. 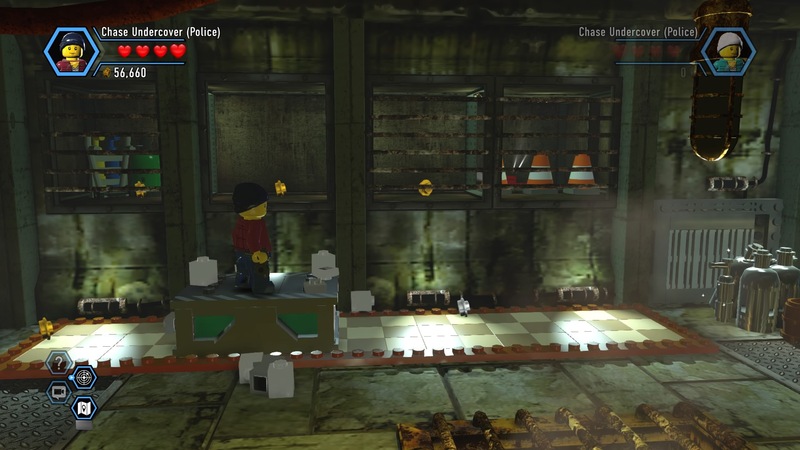 20k Super Brick: Behind the reception desk, grab TNT from the vending machine and place it by the right statue. When it explodes, another area behind the desks will open. 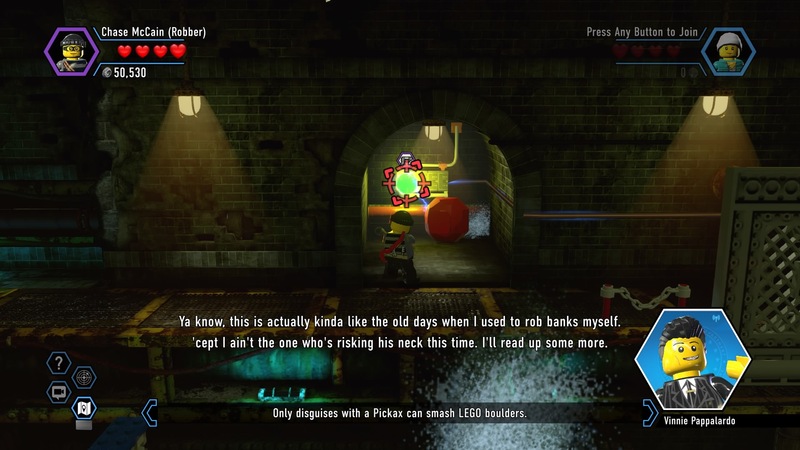 Use the Robber Disguise to crack both safes for a bunch of Super Bricks. 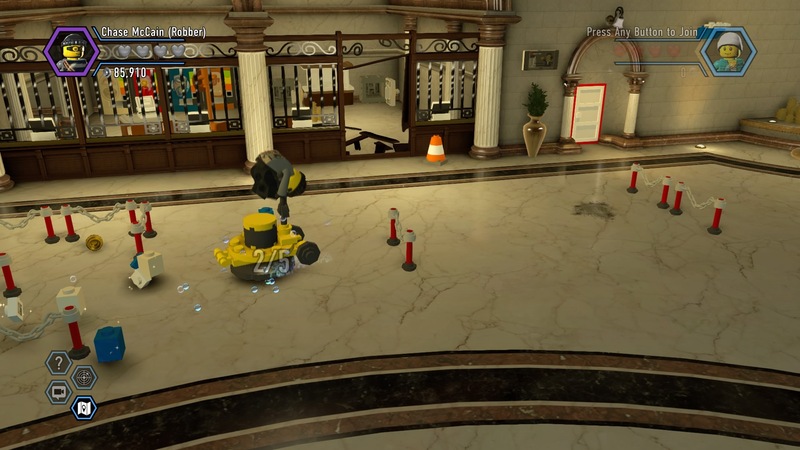 Police Shield Part: In the lobby, use the scrubber vehicle in the front-left corner to clear all five dirt spots. When you're ready to go, complete the Super Build to escape on your jet-powered snowplow. That finishes the level, but Chase still needs to drop the Bell Pepper Emerald off at Vinnie Pappalardo's meeting spot on the bridge. 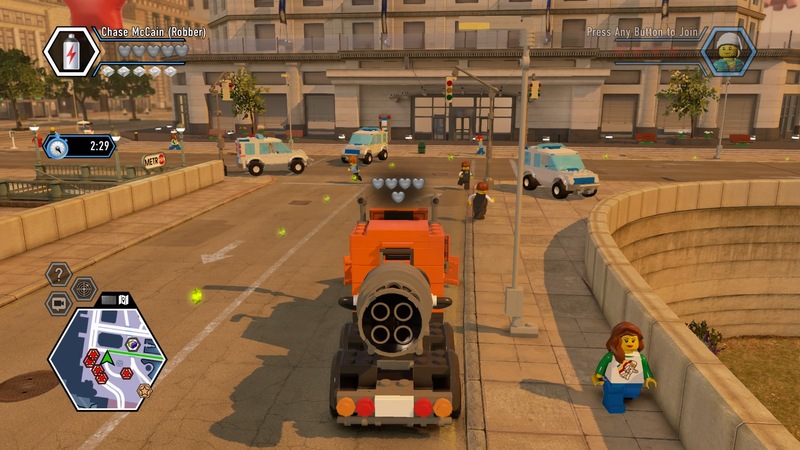 Plow through the police barricades and make frequent use of your nitro to escape! The chapter isn't over yet. The Chief wants Chase to take photos of suspects in Chan's gang - Ellie helpfully updates the Communicator so it can use the new camera function. Like the Detective Scan or Audio Scan, this ability is only situational - at first - you can take pictures whenever you want after this job. Back at Chan's place in Pagoda, Chase plans on scoping out the Noodle restaurant nearby. Use the Robber disguise to break into the door to the left of the scrapyard and access the Color Swapper. Grab the red color, then use the awning to climb up onto the facade. Shoot the green light to turn it red, stopping the fans. Step onto the catapult pad to reach the vantage point. Use the Audio Scan to listen in on the lunch meeting. You'll learn there are three meetings going down, all at the same time. Climb onto the pagoda in the center of the park to get a good view of the meetings. Grapple up from the front, then climb the ladder to reach the top. From here, Chase can take four snapshots - of the meeting at the pharmacy, in the alleyway, and at the Limo Company. Slide down the zip-line to take one final picture. Of course, Chan's men attack - defeat them to complete this chapter.